My history with foundation has been a rough journey. If I had a dollar for every time that I've said that I have acne prone skin on this blog, I'd have enough money to pay for it all to go away. I go through a vicious cycle with foundations and skincare where I need to wear foundation to cover up the never-ending redness and party of zits on my face (three cheers for hormonal acne, thanks a lot Type-A personality! ), but also run the risk of new foundations irritating my skin and making everything ten times worse. And before someone says "But Francesca, you don't need to wear foundation," I know I don't need to and I could bare face it all I want but I don't want to do that. I feel really gross and insecure when I'm bearing my naked face, acne, scars and all, and I prefer not to put myself in that mindset. So, to combat that crippling insecurity of mine (LULZ), I like to wear foundation, medium to full coverage depending on my skin's mood. I tried some drugstore foundations back in the day that made things worse. Then I tried out an Origins foundation which I liked, especially since it didn't break me out, but it just wasn't full coverage or long-lasting enough for me. Around this time is when I discovered the Covergirl 3 in 1 foundation that I continued to wear up until, well, like fall of 2016. FALL 2016. For about three or four years straight I was wearing the same foundation in varying shades depending on whether or not I actually got tan over the summer. That's a pretty long relationship with a makeup product for someone who owns upwards of like 86 lipsticks. The NARS All Day Luminous Foundation got me out of my committed relationship with the Covergirl foundation and I haven't gone back since. Don't get me wrong, there's nothing wrong with the Covergirl foundation. I still like it! I'm just finally enjoying trying new things for once in my life. I have a few criteria when I'm hunting for foundations. I like medium to full coverage, but I don't like to feel the products on my skin. I don't like super, super matte foundations because while I do have somewhat oily skin, I'm also prone to mini dry patches and the last thing I need to add on top of my bad skin is little gross flakes of dry skin lingering around on the most annoying spots of my face. Okay, so maybe my few criteria is just that I like it to last a long time, I like it to feel nice and I want a little bit of a dewy finish but not so much where it looks like I dipped my face in oil for god knows what reason. LONG STORY LONG, I picked up two new foundations at Sephora a couple of weeks ago and I think I've had long enough to test them out to say that I love them. Wow, my journalism degree and professors beating the inverted pyramid into my brain clearly haven't helped me out in this situation. I digress, I picked up the Tarte Amazonian Clay Full Coverage Foundation in Fairly Light Beige and the Too Faced Born This Way Foundation in Pearl. I will say, I like the Too Faced foundation better. Not to say I don't like the Tarte one, but I've been using the Too Faced one more. I'll get into more specifics about the latter later, but for now, let's dive into the land of the Born This Way Foundation. On the bottle, it literally says "medium to full coverage" and oil free AKA two of my criteria. I apply this one with a makeup sponge, as per recommended by my friend. I haven't tried it with a brush and honestly, I don't know if I want to. I love the finish I get with just a few pumps of foundation and just blending it out on my face with a sponge. It gives a really nice medium coverage for the first light layer. Sometimes I need more because I know the redness with peek through my concealer, but most of the time, I'm good to go in one fell swoop. I don't even know how to describe the finish of this foundation. It's matte, but it still has dimensions to it? It doesn't feel cakey or heavy on your face. It just gives a nice smooth and flawless finish and it's seriously weightless. I don't get an itchy face during the day or notice it starting to break apart around the corners of my nose or around my mouth. It's just an all around good foundation and I'm surprised I don't hear more about it on Youtube! I haven't been using the Tarte Amazonian Clay Foundation a lot lately because my skin has been a little dry and this foundation is matte. The coverage is amazing, it's definitely more full coverage than the Born This Way foundation, which allows for slightly less breathing of the skin. The foundation has a more thick consistency, so rather than a normal liquid foundation, it comes out a bit thicker, more like the consistency of a paste or cream. This is a foundation that requires very little concealer after it's applied because it will just paint over your features and mask everything you want to be masked. I will note that since this is matte, I have noticed it breaking apart a little bit around my nostrils and on my chin, but I also wear my makeup for long periods of time and that's bound to happen regardless of what I'm using. I do like this foundation though! I'm not sure if its 12-Hour full coverage, but it gives me a good eight or so hours without budging and if my skin wasn't so spotty and irritating right now, it would probably last a bit longer, too. I'll keep playing around with both foundations and switching back and forth to see which one wins the battle for my heart. Who knows, maybe both will come out victors for different reasons! What's your favorite foundation to use? 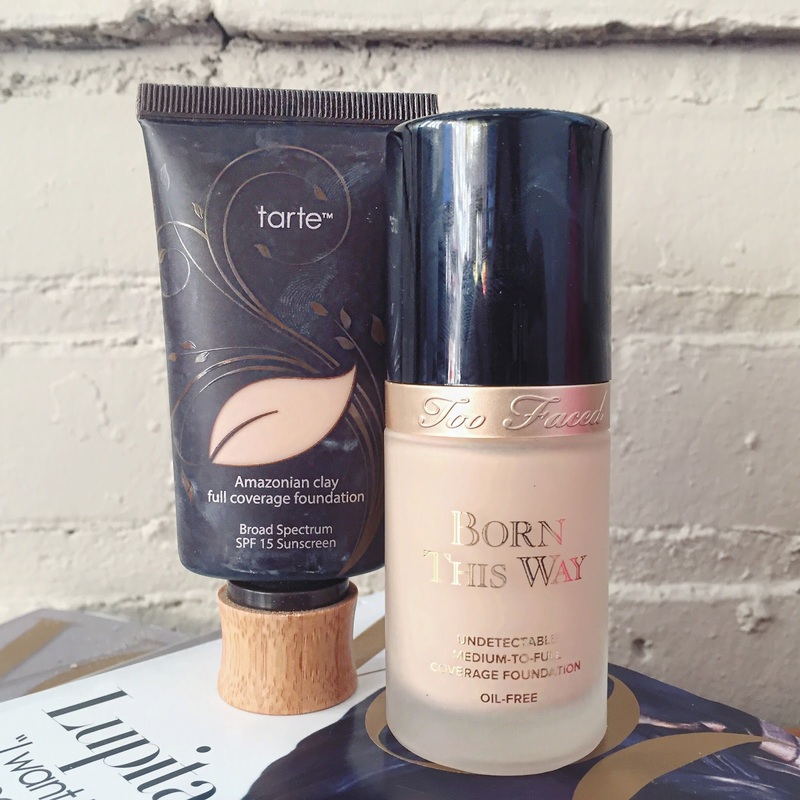 Interesting, I've always wondered about the Tarte foundation, so I'm glad you wrote about it here! It's one of those foundations that I don't hear many people talking about, despite the Amazonian Clay line being as big as it is. I will say, since writing this post, I rarely use it. It's a little too thick for my preference and I'm not a huge fan of the fact that it's entirely matte. But if you're into full coverage and matte skin, then this will be great! I love foundation, whether it's lightweight or full coverage. It's honestly the biggest staple of all for me in terms of makeup!